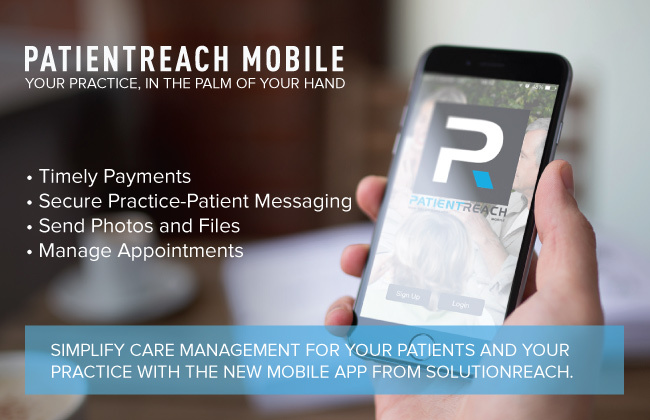 PatientReach Mobile is a free app for your patients that allows you to stay connected with them via the technology they are using all day, every day. With quick and easy tools like secure practice-patient messaging, appointment requests, and lightning fast payment collection, your practice will never be farther away than your patient’s back pocket! Everything your patients need to stay in touch with your practice is right at their fingertips. The home screen’s clean layout makes it easy for patients to begin navigation to your practice, call the office, or instantly add your contact information into their phone’s directory–all with the tap of an icon.